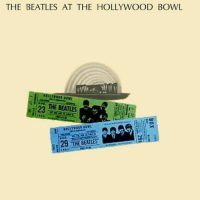 The Beatles' only official live album was recorded over three nights at the Hollywood Bowl in Los Angeles, in 1964 and 1965. George Martin had originally wanted to record The Beatles' concerts at New York's Carnegie Hall on 12 February 1964, during their first US visit. Although Capitol Records agreed, he was denied permission by the American Federation of Musicians. As the effects of Beatlemania became all pervasive, the label decided to release a live album to capitalise on The Beatles' US success. During their first full American tour Capitol agreed to record the group's concert at the Hollywood Bowl on 23 August 1964. George Martin was at the venue, working with Capitol Records' producer Voyle Gilmore on the recording. The concert was seen by 18,700 people. George Martin made such a speech. It sounds like he changed it but I doubt it. There's not much he could do. It was recorded on three-track machines with half-inch tapes. The Hollywood Bowl has a pretty good stereo sound system so we plugged our mikes right in there. I didn't do an awful lot. There wasn't much we could do. They just played their usual show and we recorded it. It wasn't that bad. I kept thinking, 'Maybe we'll get permission to release the tapes.' So I took them back to the studio and worked on it a while. I worked on the applause, edited it down, made it play and EQd it quite a bit. The Beatles heard it and they all wanted tape copies. I had five or six copies made and sent over. That's where the bootlegs must have come from. We had a system at Capitol and we knew where all our copies were. The Beatles said they liked the tapes, that it sounded pretty good, that they were surprised but they still idn't want to release it. I thought the first concert was a little better than the second. I don't know if I would have put them together like they did because doing it that way they have sacrificed an album. They really could have made two albums. The Beatles performed 12 songs at the concert: Twist And Shout, You Can't Do That, All My Loving, She Loves You, Things We Said Today, Roll Over Beethoven, Can't Buy Me Love, If I Fell, I Want To Hold Your Hand, Boys, A Hard Day's Night and Long Tall Sally. The Hollywood Bowl was marvellous. It was the one we all enjoyed most, I think, even though it wasn't the largest crowd – because it seemed so important, and everybody was saying things. We got on, and it was a big stage, and it was great. We could be heard in a place like the Hollywood Bowl, even though the crowds was wild: good acoustics. George Martin was initially reluctant to tape the concert, and after mixing the tracks on 27 August Capitol decided the quality of the recording was not suitable for release. They did, however, include a 48-second extract from Twist And Shout on the 1964 documentary album The Beatles' Story. We recorded it on three-track tape, which was standard US format then. You would record the band in stereo on two tracks and keep the voice separated on the third, so that you could bring it up or down in the mix. But at the Hollywood Bowl they didn't use three-track in quite the right way. I didn't have too much say in things because I was a foreigner, but they did some very bizarre mixing. In 1977, when I was asked to make an album from the tapes, I found guitars and voices mixed on the same track. And the recording seemed to concentrate more on the wild screaming of 18,700 kids than on the Beatles on stage. The Beatles returned to the Hollywood Bowl the following year, playing two further sell-out concerts on 29 and 30 August 1965. Capitol Records again recorded the two shows. They played the same set on both nights: a truncated version of Twist And Shout, followed by She's A Woman, I Feel Fine, Dizzy Miss Lizzy, Ticket To Ride, Everybody's Trying To Be My Baby, Can't Buy Me Love, Baby's In Black, I Wanna Be Your Man, A Hard Day's Night, Help! and I'm Down. Although they had hoped the 1965 recordings would be better than the previous year's, Capitol decided that the quality was insufficient for release. The tapes remained in the record company vaults for several years, and in 1971 were given to Phil Spector to see if an album could be prepared. However, Spector's work came to nothing, and the tapes remained unreleased for several more years. Capitol called me a few months back and asked if I could help find the tapes in the library and, of course, I knew right where they were. They wanted to get permission to put them out and thought it would be useful if George Martin was involved, since he knew the boys and had made all their other records. In the mid-1970s Capitol president Bhaskar Menon gave George Martin the tapes and asked him to compile an official live album. Although impressed with The Beatles' performances, he found the sound quality disappointing. Nonetheless, in January 1977 he began working with studio engineer Geoff Emerick to clean up the master tapes and assemble a set of songs for release. There have been an awful lot of bootleg recordings made of Beatles concerts around the world and they've been in wide circulation. But when I listened to the Hollywood Bowl tapes, I was amazed at the rawness and vitality of The Beatles' singing. So I told Bhaskar that I'd see if I could bring the tapes into line with today's recordings. I enlisted the technical expertise of Geoff Emerick and we transferred the recordings from three-track to 24-track tapes. The two tapes combined 22 songs and we whittled these down to 13. Some tracks had to be discarded because the music was obliterated by the screams. The recordings were transferred to 24-track tapes to be edited, filtered and equalised. No redubbing of voices or instruments took place. Eventually an album was assembled consisting of recordings from all three Hollywood Bowl concerts. Six songs were included from the 23 August 1964 concert tapes: Things We Said Today, Roll Over Beethoven, Boys, All My Loving, She Loves You and Long Tall Sally. Due to an error, the tracklisting for The Beatles At The Hollywood Bowl lists all the recordings as dating from 1964 or 30 August 1965. However, three of the songs – Ticket To Ride, Dizzy Miss Lizzy and Help! – originated from 29 August 1965. Unfortunately a technical fault left Paul McCartney's vocals and introductions inaudible during the first four songs of the first 1965 show, rendering a substantial portion of the recordings unusable. Five songs from 30 August 1965 appeared on The Beatles At The Hollywood Bowl: Twist And Shout, She's A Woman, Dizzy Miss Lizzy, Can't Buy Me Love and A Hard Day's Night. The album version of Dizzy Miss Lizzy was a composite edit incorporating parts of the 29 and 30 August performances. Some of The Beatles' on-stage announcements were inconsistent when presented in album form. A Hard Day's Night and Help! are both referred to as their latest albums, owing to the different recording dates.